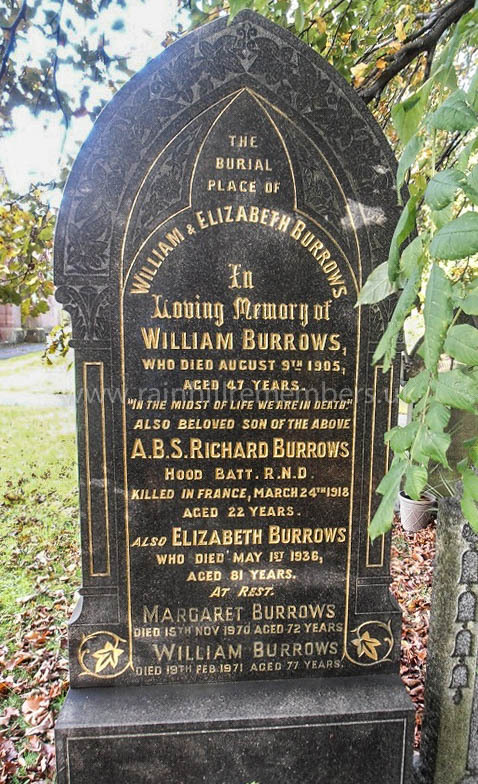 Richard Burrows was born in Ratcliffe Cottages, Rainhill on 16th August 1895 to William and Elizabeth Burrows. He was baptized in St Ann’s Church, Rainhill on 1st March 1896. His father was a coal miner and on the 1911 Census Richard is listed as a 15 year old plumber. He enlisted 4th July 1917 and was drafted in October to BEF. In November, he joined the Royal Naval Volunteer Reserves as an Able Seaman and was part of the Hood Battalion, Royal Naval Division. The Royal Naval Division had been formed in 1914 from naval forces when warships were fully crewed. The tradition of naval personnel serving on land had long been established and a shortfall of infantry divisions in the army led to the formation of the RND. Personnel from RNR and others assembled at Crystal Palace to form RND and by 1916 189th Brigade was made up of Drake, Hood, Nelson and Hawke Battalions. Faubourg-d’Amiens Cemetery, Arras on the Memorial to the Fallen. His name is also inscribed on the family gravestone in St Ann’s churchyard.